What’s hot and cold is trolling for Sockeye Salmon below Wells Dam on the Upper Columbia. Chinook numbers are up, so it should really take off during this reporting period. Also hot is trolling the Bar for Lakers early in the morning on Lake Chelan. That indeterminate flat and the Yacht Club were hot later in the mornings. Fish for sockeye with Mack’s Lures mini squid rigs behind big chrome dodgers or simply bait a tandem red hook set up with Pautzke cured shrimp chunks. For the Chinook try sardine wrapped T55 Flatfish. Colors are matter of experimentation. 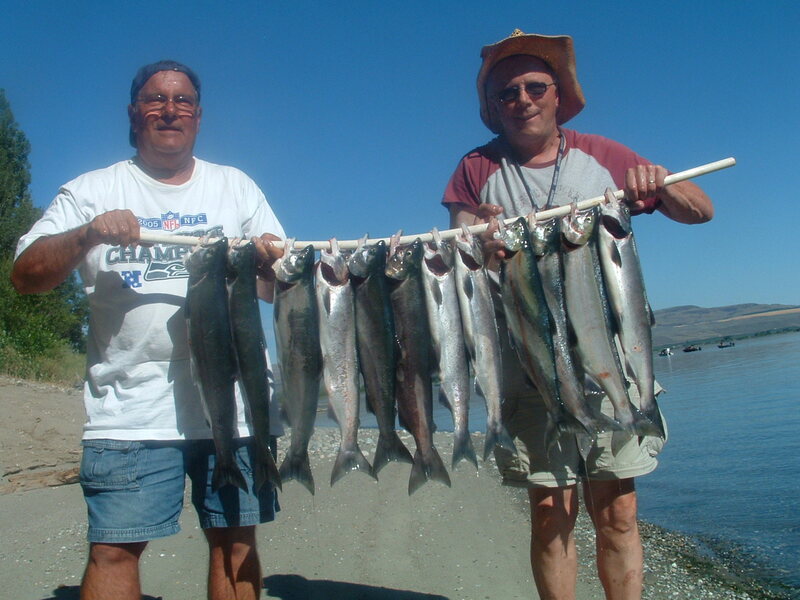 Fish for Lakers on Chelan with T-4 Flatfish in Purple Glow or those UV / glow Kingfisher lite spoons off the downriggers. Fish the little F7 flatfish in the same colors off the outrigger rods. After the early morning bite, we have had nice success in the indeterminate flat just below the Bar, up at the Yacht Club and at the nursery. Your fishing tip of the week is to take care of your fish. I got a chance to catch some Sockeye off the mouth of the Okanogan one evening this past week. I was horrified to see people dragging their caught fish around on a rope on the surface of the water. If that doesn’t ruin them, I don’t know what will. I’m not a great believer in bleeding, but whether or not you bleed them, for heavens sake, get those fish on ice to preserve their delicate flavor and texture. The kid’s tip of the week is to put your own ego aside and measure success by the kid’s satisfaction. I was struggling in the wind to get my fish one morning this reporting period with a father and young son out. The boy was being real good, but my song and dance routine was wearing thin with just a couple of fish in the box. I really wanted to get another big fish. But, this trip was for the kid’s sake. I asked the dad if he minded if we broke it down and went to the nursery to pile up some little fish to get the kid back in the game. He said, go for it, so we did. We pounded a bunch of little fish and the kid was happy as a clam, so all’s well that ends well. The safety tip of the week is to try to resolve mechanical issues before launching at a busy time. We had a guy who was having mechanical issues on a busy summer weekend morning at the Launch. He nearly clipped two docked boats while trying to get it worked out. Also, give those trollers lots of space before cutting across their stern. Remember, those outrigger rods can have trailing lines of 500’ or more! This entry was posted on July 19, 2010 at 4:17 pm and is filed under HEADLINES. You can follow any responses to this entry through the RSS 2.0 feed. You can leave a response, or trackback from your own site.